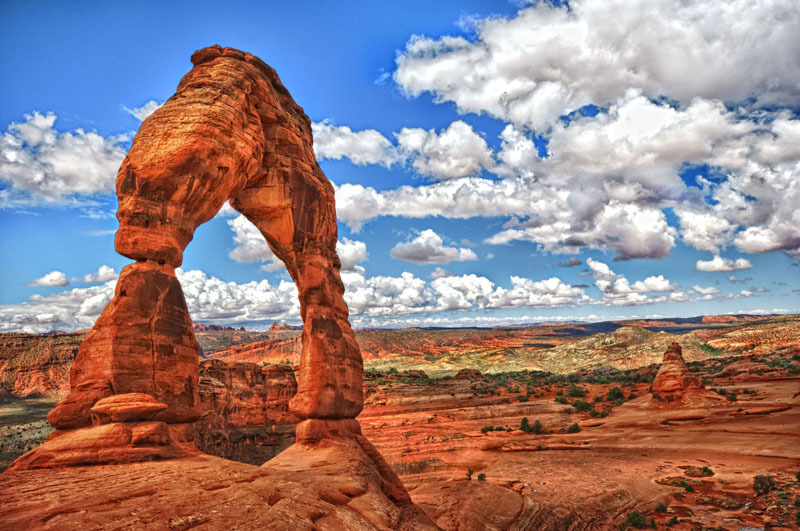 One of the most prominent landmarks in Arches National Park, and all of Utah for that matter, is Delicate Arch – it has even been featured on the state license plate. From the nearest parking lot, it is about a 1.5 mile moderate hike to the arch. The path isn’t always obvious, but many times throughout the year you will see a large number of people on their own hike to this famous arch. If you plan to visit, be sure to check the weather first, especially during the summer months as this area can get quite hot. We were fortunate enough to have experienced fairly cool weather when we visited in June during this trip. Delicate Arch is a natural structure, formed in the surrounding red sandstone by wind and erosion. The arch stands nearly 65 feet tall! Check out Delicate Arch in the gallery!